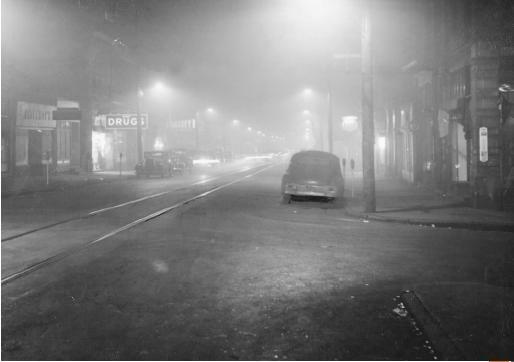 The towns of Donora and Webster, Pennsylvania, along the Monongahela River southwest of Pittsburgh, were the site of a lethal air pollution disaster in late October 1948 that convinced members of the scientific and medical communities, as well as the public, that air pollution could kill people, as well as cause serious damage to health. The disaster took place over the course of five days, when weather conditions known as a temperature inversion trapped cooled coal smoke and pollution from a zinc smelter and steel mill beneath a layer of warm air over the river valley that enclosed the two towns and the surrounding farmland. Almost half of the area's 14,000 residents reported becoming ill and about two dozen deaths were attributed to the badly polluted air. © Pittsburgh Post-Gazette, all rights reserved. Reproduced by permission. After the disaster, fact-finding studies conducted by federal, state, and local government, as well as the steel industry and private investigators, never definitively identified the exact mix of pollutants that caused the deaths and illnesses. It is believed that a thick blanket of sulfur oxides, carbon monoxide, and particulate literally smothered the towns. Donora is remembered as a key event that inspired federal air pollution legislation in the 1960s and 1970s and contributed indirectly to the establishment of the U.S. Environmental Protection Agency in 1970. It helped mobilize public sentiment in favor of federal regulation rather than continued state and local jurisdiction over polluters. SEE ALSO A IR P OLLUTION ; C LEAN A IR A CT ; C OAL ; E NVIRONMENTAL P ROTECTION A GENCY ; H EALTH , H UMAN ; H EAVY M ETALS ; I NDUSTRY ; L AWS AND R EGULATIONS , U NITED S TATES ; S MOG . Roueche, Berton (1950). "The Fog." In The Medical Detectives, Vol. 2, pp. 37–55. New York: Washington Square Press/Pocket Books. Snyder, Lynne Page (1994). "'The Death-Dealing Smog Over Donora, Pennsylvania': Industrial Air Pollution, Public Health Policy, and the Politics of Expertise." Environmental History Review 18(1):117–139. Pennsylvania Department of Environmental Protection. "History of Donora." Available from http://www.dep.state.pa.us/dep . Pollution is a big issue. If we shall not concern on it now than it will destroy us. The towns of Donora and Webster can be taken as an example.